In this post I am going to share some important mechanical Engineering Software (Android Apps). In Play Store Market there are lots of applications are available, among these Here I mentioned some Important apps. We pick the best based on top rated, most downloaded apps by experienced engineers. Rated highly among mechanical engineers due to its highly interactive user interface, this app can convert any unit into your desired units. The monthly update by the developers adds new units which are quite helpful plus the developers encourage mechanical engineers to mail them in case they want some units to be added to the app. The app has gained much fame since the launch and provides offline free usage with no Ads or hidden promotions. This is a magazine which is published in association with the American Society of Mechanical Engineers (ASME) and it provides with the latest insights into the technology aspects of the world. The magazine provides the paper presentations from all over the world to its readers for a better understanding of the mechanical engineering phenomenon. The app has a catalogue that allows the users to surf through various articles and reference papers to get know-how about the latest innovations. The app is considered to be the best in its category and with its catchy interface, it is a must have for mechanical engineers. Just got admitted in mechanical engineering degree and can’t find the appropriate course books? Well, this is the app for you then. Just install this app and it will provide you with a list of books which you can see and even buy if you consider that book to be valuable in your studies. Autodesk is among world’s best companies when it comes to designing, and the launch of Autodesk ForceEffect Motion has greatly helped the mechanical engineers. This android app is a tool which allows users to design the kinematic links and find their functional equations on their smartphones or tablets. Leaving behind the old methods of finding the equations and functions of various motions, this app will help the mechanical engineers in finding their designing solutions. It is mostly like AutoCAD and needs a little guide to use it, but it’s relatively easier than AutoCAD to use and defining functions of machine designing is also very easy in the app. This app enables you to quickly and easily simulate design options during the concept phase to determine the viability of a design. 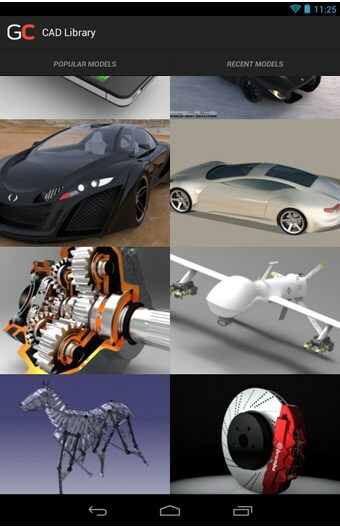 A cloud-hosted collaboration and file-sharing service, GrabCAD allows engineers to manage, view, and share CAD files. The app offers access to both the GrabCAD public library of CAD models as well as private projects stored on GrabCAD Workbench. Using this app, engineers can view CAD models in full 3D, regardless of the format they were created, view and respond to comments, create Workbench projects and upload files to them. The app also allows you to upload photos right from your phone – take a picture of a part or a quick napkin sketch and attach it to a project – and get feedback earlier in project. A free android app that’s an emulator of the HP 48 scientific calculator, using reverse polish notation (RPN), offers many advanced functions including symbolic algebra, matrix handling, calculus, statistics, equation solving, graph plotting, unit and temperature conversion, etc. The 3D buttons in Droid48 make it look almost like the actual scientific calculator used by engineers of all disciplines. 9.Mechanical Engineering 101 is an on-the-go learning app that helps you to understand the basics of “Mechanical Engineering 101.” The app provides bite-sized learning through tutorials, quizzes, and flashcards. This app provides information on heating and cooling loads, sound, and vibration. It’s simple to use and is perfect for anyone working in HVAC. AutoCAD 360 is a free, easy to use drawing and drafting mobile application that allows you to view, edit, and share AutoCAD drawings across your mobile devices anytime, anywhere.